Product information "4 x Paulaner yeast white beer nature cloudy 5.5% vol 5 liter party keg"
The Paulaner Hefe-Weißbier Naturtrüb is the bestseller No. 1 of the Paulaner brewery. Specially bred top-fermented yeast gives it its unmistakable character: sparkling-mild and fruity with a fine yeast aroma. The unfiltered brewing method retains its natural originality as well as the many vitamins, minerals and trace elements. The yeast wheat beer is the product of the year 2010. 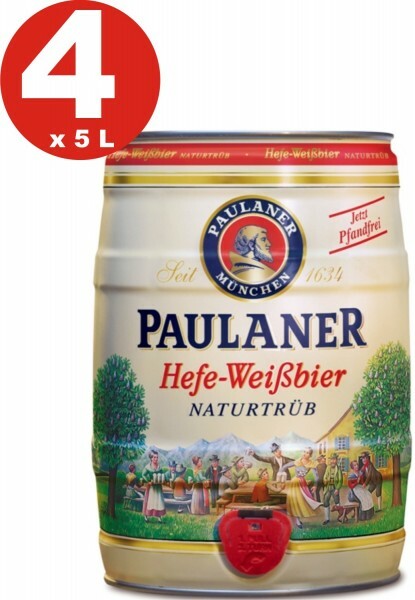 Related links to "4 x Paulaner yeast white beer nature cloudy 5.5% vol 5 liter party keg"
comment "4 x Paulaner yeast white beer nature cloudy 5.5% vol 5 liter party keg"
Customer evaluation for "4 x Paulaner yeast white beer nature cloudy 5.5% vol 5 liter party keg"